There are plenty of baseball sayings you can relate to investing -- keep your eye on the ball, step up to the plate, don't let the fear of striking out keep you from playing the game - but there's a great lesson baseball can teach us about diversification. Think of diversification like playing baseball. 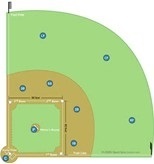 You may look at where a batter last hit the ball - let's say center field - and you could place all of your players there, ensuring you a catch if it goes to that area of the field. However, we know what happens during the last at bat won't necessarily happen during the next at bat. Even if the last three batters all hit to center field, you can't be sure the next hit will go there. What happens if the next batter hits it to the right field corner and all of your players are standing in center field? So what do you do? Well you spread out your players to cover as much of the field as possible, ensuring that you're "covering all your bases" ...literally. The other team is bound to get some hits and maybe even score some runs, but by the end of the game, chances are good you have also gotten some hits and scored some runs...maybe you even win the game. And if you didn't win today, you might win tomorrow. One thing is certain: you'll never win by putting all of your players in one place. As investors, we need to cover our bases by investing in many companies, countries and types of securities. By doing this we have a better chance of long term success.